Note: This guidance has been updated to include the safe harbour defence that came into effect 1 September 2018. A National Information Standard, made under the Australian Consumer Law (ACL), about ‘free range’ eggs came into effect on 26 April 2018. 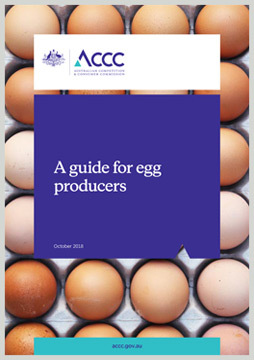 The ACCC has produced this guide to help egg producers of all sizes understand their fair trading rights and obligations when promoting or selling eggs as ‘free range’. It will also help consumers understand the law and our approach to ‘free range’ egg claims. The ACCC will have a role in enforcing the Standard, however only a Court can provide a definitive ruling on whether you comply with the Standard.